If you are a keen runner, but you started to feel pain in your legs, it may be the case that you are running with tendonitis in your knee. A wide-spread issue among active athletes, this is a problem that causes runners discomfort and can lead to serious injuries in your knee joints. How do I know I have patellar tendonitis? Not just a bane of runners, patellar tendonitis is also commonly known as ‘jumper’s knee syndrome’ and often affects runners, basketball players, footballers, tennis players, those who mostly jump, run or squat during their training. The syndrome is characterized by a pain in the knees after doing physical exercises, and in later stages, this can continue even when the body is at rest. So, if you have patellar tendonitis, aside from the pain, you may notice restrictions in your movements or a localized swelling. Or, simply, not warming up correctly. Catching tendonitis early is the key to avoiding its progression. These are the four stages you need to watch out for. At the first stage, the athlete will feel pain in the knees only at the peak of strenuous exercising. This is the time to take note and see your physical therapist to prevent further problems. If the injury is not treated in time it may develop into the second stage; a dull or attack-like pain which continues during exercise and stays for some time after training. In addition to pain symptoms that appear during running or jumping, a defining attribute of patellar tendonitis is an emerging pain when pressing down on ligaments, shins, or below the kneecaps. At the third stage, the ache worsens and causes discomfort even after 4-8 hours of rest. This makes you uncomfortable and needs to be treated as soon as possible. At this final stage your knee will hurt all the time, ligaments become less firm, and that may lead to their rupture. So, this means you need to act now, before it gets worse! That said, all in all, if you undertake any activity, jumping, squatting or running with patellar tendonitis, or even if you just think you have it, you need to stop and seek treatment right away. What to do when you have patellar tendonitis? Handling patellar tendonitis depends on its stage of development. If after running you feel discomfort in your knees or below your kneecaps, such as burning or sudden pain, the first thing to do is to consult your physical therapist. At this early phase of the syndrome, anti-inflammatory medications may be a good solution as it is the fastest way to ease pain and reduce the inflammation. Other ways you can try to relieve the burning sensation are to put some ice on the affected area, to get a massage (you deserve it anyway) and to stretch muscles around your kneecaps before training. If it becomes more painful and you find yourself wondering if you can run with patellar tendonitis, then it is better to refrain from physical activity and hang up those running shoes for some time. 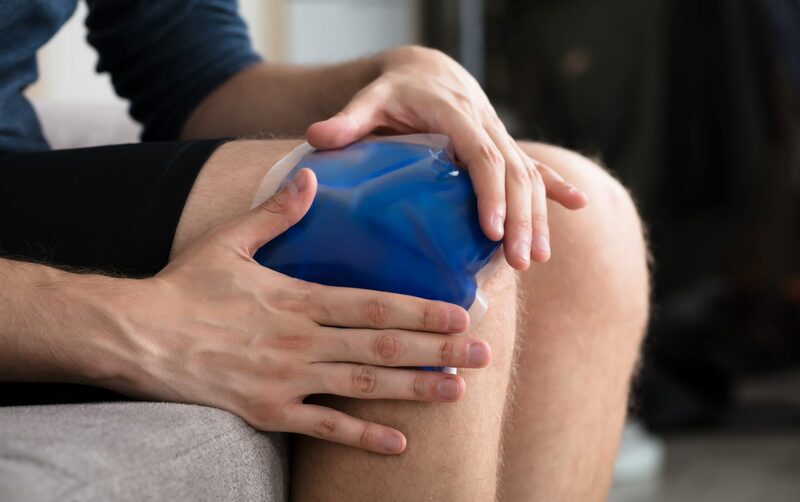 During this remission period, even when you once again feel comfort in your knees, you need to start building up pressure on your knee joints gradually, which means avoiding any significant strain on ligaments to ensure no further injury happens. Elastic bandages or special supportive tapes can be a great solution to helping your knees remain healthy and supported. While all that sounds pretty scary, fortunately, it is possible to prevent patellar tendonitis with a number of techniques. The first thing to concentrate on is the development of those muscles that support the knees––the muscles of lower back, hips, and ankles. Consult your physical therapist or professional trainer to get advice tailored to you with specific exercises for the lower body. Work on your jumping and landing techniques. It has been proven that athletes who land hard on their feet are prone to develop tendonitis. So, if you engage in hurdles, the long jump or even parkour, you will need to adapt your landing style. Pay close attention to the way you run; if you put your foot too ahead when running, you may overstride. This can also lead to tendonitis, so it is vital to control your feet, ensure they land exactly underneath your body and not in front of your hips. Don’t be in a hurry when you run, try to keep the same tempo and stabilize the pace up to around 180 steps a minute. In addition to the above-mentioned strategies, it is necessary to avoid exercises with high-altitude jumps and landings with deep squats as they cause the development of patellar tendonitis as well. So, take great care of your joints as they become the most vulnerable part of your body when you perform these types of exercises. Choosing more peaceful types of workout such as yoga or Pilates can be beneficial to improving the health of your tendons. With such types of exercise, there are no sudden moves and they are great for training your stamina, balance, and flexibility. If you need of a strenuous but gentle-on-the-tendons workout, power yoga makes an excellent choice as most of the activities consist of static and stretching exercises with minimum traumatic effects to your joints. Last, but not least, one final step to ensuring the health of your tendons; it is necessary to find comfortable and supportive running shoes and change them regularly. Replacing your running shoes is vital as they lose their supportiveness when they are over worn, putting you at increased risk of injury. Running with patellar tendonitis can be hard to detect at early stages but can develop into a serious issue later. For this reason, whether you are an amateur or a professional runner you should make sure that you devote enough attention to your running technique, the strength of your body and choosing the right running shoes for you. These simple rules will keep you healthy and injury-free for a long time. Download This App and Enjoy Walking! Walking is one of the best and healthiest ways to get toned, burn calories and gain muscle mass.